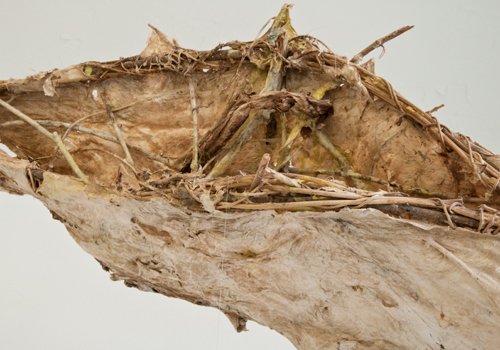 This is the first instalment of our sculptural papermaking series. Paper’s sculptural properties are some of our favourite things about the medium. In this class we explore the lightness and toughness of paper through casting . Learn how varying the fibre and how it is processed can produce an almost limitless variety of pulps from soft opaque cotton to hard translucent flax and hemp. This variety makes paper an exciting material when combined with light. We will show multiple techniques such as casting over forms on a vacuum table and tamping over soft objects. You will experiment with paper that shrinks like leather by allowing it to tighten around existing armatures or objects. See paper bend wires and reeds into shapes as it shrinks. Students will leave with a collection of samples and handmade sculptural objects. This is a two day workshop, on July 19 and 20 from 11 am – 5 pm on both days.